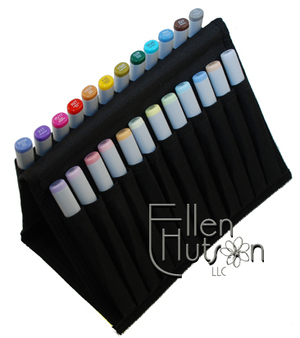 Ellen, I have been purchasing the markers from your store, and am eagerly (but patiently :-) awaiting the arrival of my most recent orders (more Sketch markers AND the new glitter pens!). I would LOVE to order some type of container/holder for them. When all arrive, I will have at least 48, so whatever works best for those is what I need. In addition, I am hoping you will be adding two markers from your list of SU "matches" which I was unable to find in your store: RV11 Pink (Pretty in Pink) and Y19 Napoli Yellow (Summer Sun). Thanks for all your hard work in bringing us the best of the best in new and exciting products! I hope your foot heals quickly and that you're back going at full-speed again soon! 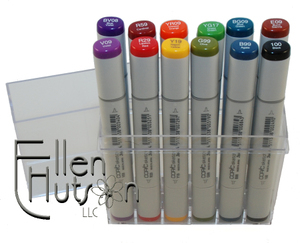 Like Jimmy Carter, I have "lust in my heart" for these markers! Hope you get good news on your ankle so you can be up and running!